The needle is a TQWT (Tapered Quarter Wave Tube) speaker designed by Bernd Burghard (often called Cyburgs in Internet forums). He kindly allowed us to use his cabinet for the Mission CP-10X coax system. The Needle CX is designed according to the TQWT principle. Initially, the design seems to be similar to a transmission line. The TQWT duct's diameter, however, is increasing towards the outside; Furthermore, the driver is not located at the beginning of the duct, rather closer to the centre. At the end of the duct is also a bass reflex tube. As a result, there are two phase shifting elements involved: the TQWT duct, shifting the phase due to the delay and the bass reflex tube at the end, playing an important role with regard to air mass. Therefore the name mass loaded TL or mass loaded TQWT. The coax system is controlled by a two-way crossover. The crossover only does the bare minimum, but with in an intriguingly effective way: apart from the inevitable waviness due to the driver type all loudspeakers of the set have an astonishingly linear frequency response - on axis towards the tops with increasing volume, at angles considerably more balanced and with an excellent omni-directional sound. The waterfall spectrum shows two small problem areas which we simply don't take seriously, considering the price of 21 Euros for the driver. 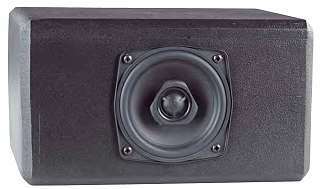 Surround sound receivers with low impedance drive problems (i.e. almost all of them) are lucky since the impedance remains permanently above 8 Ohm and there are no major phase shifts either. Regarding power handling I would say that the 95 dB measured are the upper limit - it's just not possible to get any louder below 200 Hz with these cones. Otherwise K2 and K3 remained below the 1% mark. The needle is the only one that produces some sort of bass, relinquishing the need for subwoofer. For surround sound I would recommend closing the channel to achieve a more balanced frequency response. "With the channel open the Needles were put into stereo mode: pleasant, open, and considering their price range theses slim speakers produced amazingly subtle music, almost audiophile and enjoyable over longer periods. Real low bass doesn't exist, but is compensated for by a slight exaggeration of upper bass; there are quite a few enthusiasts who don't require more bass to listen to music and are happy with it. That's certainly understandable. In surround mode the five identical speakers produce a phenomenal three-dimensionality - with such tonal accuracy that one should stop considering finished speakers of the lower price range. In conjunction with one or more subwoofers there is no need for larger speakers - and if you switch to small speakers" with high pass filter on the receiver then the level is sufficient for concert DVD's. The highly musical abilities of the entire set ensure that the sound is just right." a centre, the front speakers (either our satellites or the floorstanders) and rear speakers (again either our satellites or the floorstanders) are required. 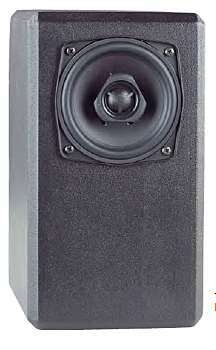 All kits (floorstanding speaker, satellite, center and rear) require the same electronic components. Our kit for satellite, rear and center require with 1 meter cable somewhat less the floorstander. At the bottom you'll find the high-end version suitable for all kits. In our standard version for home cinema, the capacitors in series to the tweeter are MKT (polystyrol) instead of MKP (polypropylen) capacitors. In series to the woofer a core coil is used instead of an air core coil. Our high end version is good for the floorstanding, but is also good for rear, sat or center. It contains with one exception only polypropylen capacitors and air core inductors with baked varnish coil.